3D printing at the nanoscale isn’t new, but its applications are still being discovered. When the process, known as two-photon lithography, first began making headlines, many of the demonstrations involved the fabrication of aesthetic models: microscopic race cars, space shuttles, and even ancient Roman sculptures. However, researchers have also been applying the technology to the field of medicine. So far, the results have been somewhat limited, from a mechanical standpoint. For instance, one team has coated the tips of 3D-printed “sharks” in iron in order to guide their movements with magnetic fields. Other groups have worked on developing new geometries that can be beneficial in increasing the surface area of drugs used in targeted delivery. These studies do demonstrate the potential for nanotechnology in some applications, but, in some ways, the objects printed are the same aesthetic objects with some added medical superpowers. Mechanically, there have been few examples of true micromachinery. That is, until Roberto Di Leonardo, a physics professor at Sapienza Università di Roma and at NANOTEC-CNR in Rome, developed a series of micromotors, which are powered by bacteria and ordinary LED light. In the experiment conducted by Di Leonardo’s team, you can see the beginning of what could be the future of micromachines, including a series of 36 micromotors rotating in unison. Di Leonardo’s lab actually constructed its own two-photon lithography system, which uses a high-powered laser to direct two photons of near-infrared light in ultrashort pulses at a photocurable resin. Unlike commercial nano 3D printing systems, like those from Nanoscribe, Di Leonardo’s team introduced a special modulator to the setup, making it possible to split the beam so that it can selectively cure multiple areas in parallel. This essentially makes it possible to 3D print the same object en masse, as was the case with the 36 motors printed in his study. 3D printing is not the only technology that can be used to create microscopic assemblies; it just happens to have the benefit of being able to produce fully assembled systems, such as the motors demonstrated in this study. Unlike other forms of 3D printing, two-photon polymerization has the benefit of 3D printing objects in a semisolid resin, making it possible to create complete assemblies. However, Di Leonardo said that there are other tools for assembly, including holographic optical tweezers, that make it possible to manipulate tiny objects with laser light. 3D printing the micromotors was not necessarily the hard part of the endeavor. The more difficult task for Di Leonardo’s group was powering the motors that were to be printed. To do so, he turned to one of nature’s existing micromachines: bacteria. “The idea is that can we can use bacteria as tiny propellers to actuate micromachines,” Di Leonardo said. The force generated by bacteria, however, is intermittent, which would cause the motors to spin for only about a minute at a time and some rotors to spin in the opposite direction. To harness the swimming of E. coli bacteria—which Di Leonardo described as the “hydrogen atom of biology” because it has been so extensively studied—the team constructed microscopic motors that had 15 microchambers along their edges, with each chamber containing room for only one bacteria. As tiny organisms, bacteria have their own swimming patterns and behavior, so the researchers also built tiny ramps that herded them into these chambers. The idea was that, once these E. coli were guided into the chambers, tilted at the 45 degrees necessary to maximize torque and their flagellum (tails) whipping outside of the chambers, the bacteria’s natural swimming would push the individual rotors. After the implementation of the ramps, however, he said the process was surprisingly successful. “In less than two minutes, the structures were completely loaded and all the chambers were occupied by bacteria. The process was surprisingly more efficient and reproducible than what we were expecting. That’s something that doesn’t happen very often in science,” Di Leonardo says. The researchers also wanted to be able to control the motion of the micromotors. This was managed by genetically engineering the E. coli to express proteorhodopsin, a proton pump that causes protons to be pushed against an electrochemical gradient. Once the micromotors were exposed to light, the team could turn the motors off and on and regulate their speed. Using a feedback algorithm that lights up the system every 10 seconds, Di Leonardo’s group was further able to cause the motors to move in unison. The use of light to control the movement of the bacteria provides significant benefits. As one might imagine, the use of power supply or magnetic fields is expensive and would not be easy to build. Moreover, the use of magnetic fields, for instance, would limit the complexity of the machine’s design. Di Leonardo explained that incorporating additional functionality into a structure’s design, such as creating gears that move at different speeds, would be difficult. 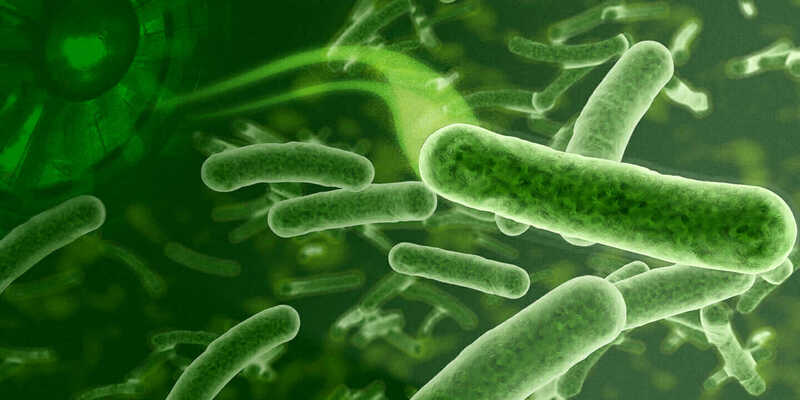 For example, Di Leonardo said that it’s possible to engineer two species of bacteria that are sensitive to different colors, such as red and green, and that actuate different parts of a device. When a red LED is lit, only those bacteria will respond and vice versa. What Di Leonardo is working on next is the ability to create structures with more degrees of freedom, such as microscopic shuttles that can be steered and accelerated. The team also plans to address multiple structures at the same time by projecting a unique light pattern. “We’re moving in that direction, implementing more degrees of freedom which are independently controllable using light patterns, which are modulated in space and time,” he says. When it comes to practical applications for the technology, Di Leonardo said that biology and medicine are the first areas that come to mind. “When you work at the microscale, your close neighbor is biology because the basic unit of life is the cell,” he says. Although the practical applications are still some ways off, he does believe that early applications may include the creation of tiny, disposable robots that can collect cells and sort individual cells in a blood sample for analysis and diagnosis. “And then, who knows?” Di Leonardo says. “This is just the beginning, and there’s still a lot to do from a technical point of view.” In order to reach a nanotech future, Di Leonardo explained that independent researchers from different fields, such as physics, engineering, and biology, will need to come together. Only then will society be able to reap the benefits of nanotechnology. Article by Michael Molitch-Hou. A version of this article appeared previously on Engineering.com.